“dangerous” it is compared to other places in South America. In our experience, it was perfectly safe and a fun, pleasant place to travel around. Some of the bus rides were long and uncomfortable, but that’s to be expected. Neither of us had any of the stomach troubles that plagued us in Peru, and we found getting around relatively easy with no road closures affecting our travels during the almost two months that we were there. All that said, if Bolivia could do away with the super annoying requirement to have your passport stamped every 30 days even though they give you a travel visa for 90, that would be great. 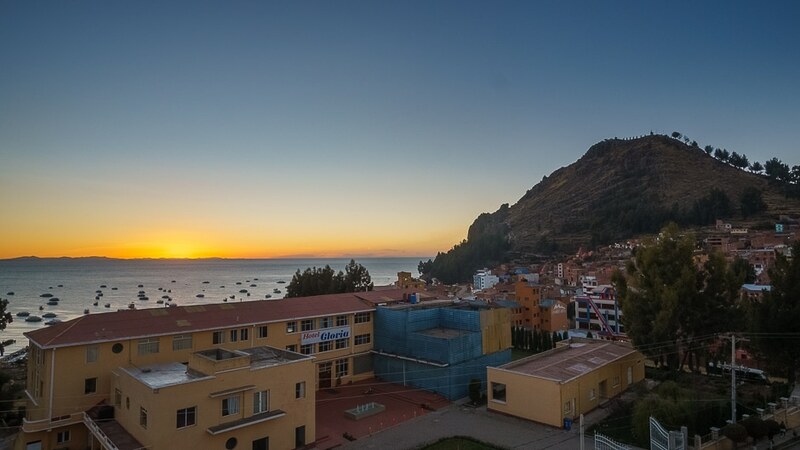 We crossed over to Bolivia from Puno, Peru on a Bolivia Hop bus stopping in Copacabana and spending a night on the peaceful and sublimely beautiful, Isla Del Sol. Since there is an ongoing blockade between the north and the south of Isla Del Sol so we wouldn’t be able to do the island traverse hike as anticipated, we thought it might be nice to go to the quieter island before moving onto La Paz. We picked up our ferry tickets in Copacabana and set out in the morning for the lovely little island. 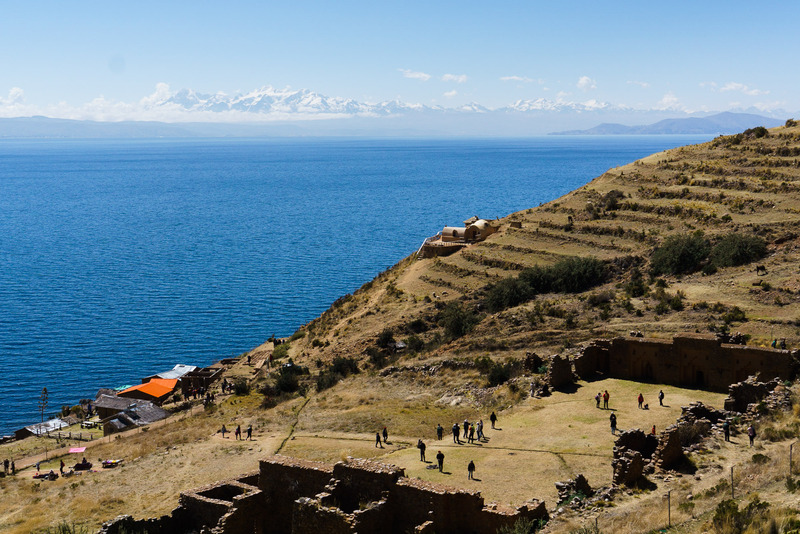 When you land on Isla de la Luna you will immediately see some Inca old ruins, curiously named the “Temple of the Virgins”. There’s not a lot of interpretive signs or posters explaining their significance, but they are interesting enough to walk around. There are many hostels portside, but we opted for one on the “quieter side” that was a 20 minute walk from the port. From the top of the Island, we got our first glimpse of the impressive, snow-capped Cordillera Real mountain range, a place where we would spend a lot of time later on. There isn’t a whole lot to do on the island other than walk around and take in the sights, as it’s population is about 80-120 people depending on who you ask. You may be able to convince a local fisherman to take you out in his boat to see the trout traps, there is a small artisan’s market near the ruins, and a kiosk to buy snacks by the port. We enjoyed simply walking around, chatting with our hosts, and relaxing in a very beautiful setting. We stayed at the Hostal Luna del Titicaca which we were able to book online through Booking.com. That said, if your Spanish is good, you may be able to get a better rate by calling the hostel directly. Quick tip: be sure to book your return ticket in advance because you’ll be charged more if you buy it on the island. From the Lake Titicaca region, we continued on to La Paz where we spent longer than we planned and were completely fine with that. First we stayed in La Paz’s bustling Centro district and enjoyed eating at good, affordable restaurants, including fine dining at Gustu which is owned by the same person behind one of the best restaurants in the world, Noma, as well as learning all about Bolivian food with a food tour. 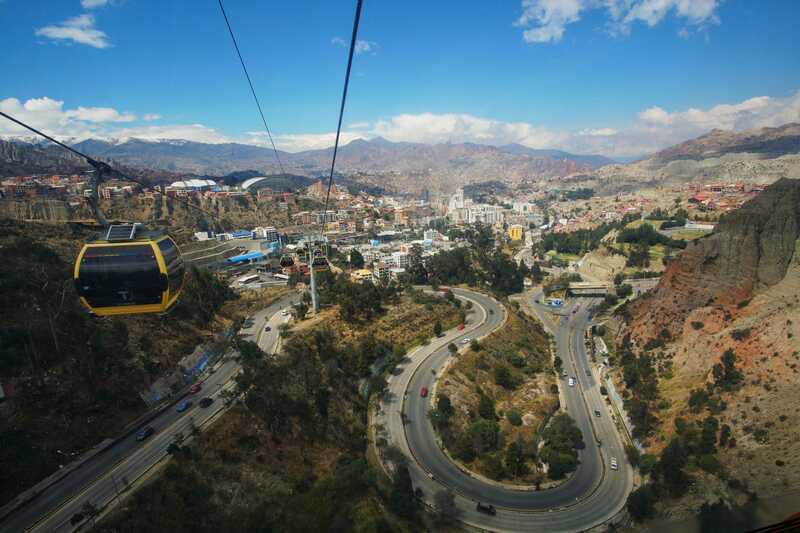 We also saw the city with a bird’s eye view from its innovative “telerifico” cable car system. Centro is where you’ll find the tour agencies to set up your trips to Bolivian highlights, such as Cholitas wrestling in El Alto, the Death Road, and trekking in the Cordillera Real. Next we moved onto the more boho Sopachinchi district where we stayed at Green House and no joking found some of the most delicious ramen that we’ve had outside of Japan at Izakaya Hinode. We also enjoyed all the fun artsy coffee shops in the region and wine on the porch of the hostel at sunset. 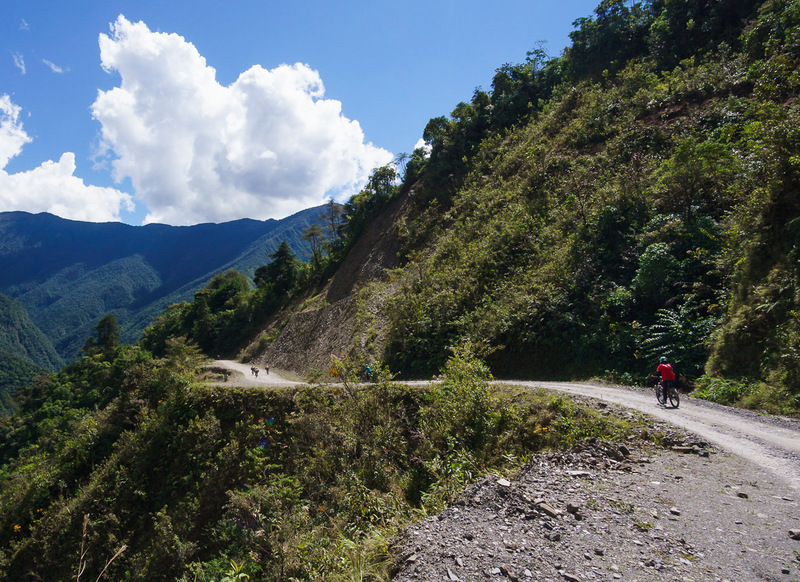 After relaxing in the boho area of La Paz, we went on a thrilling 65km ride down Bolivia’s famed death road. So named because of all the traffic fatalities that used to occur on it, the road is now mostly closed to vehicles and open to adventurous tourists on bikes. It’s fun and fairly safe so long as you don’t do silly things because there have been tourist fatalities. We loved watching the scenery change from a cold alpine environment 4700m at the start to ending in a hot rainforest. 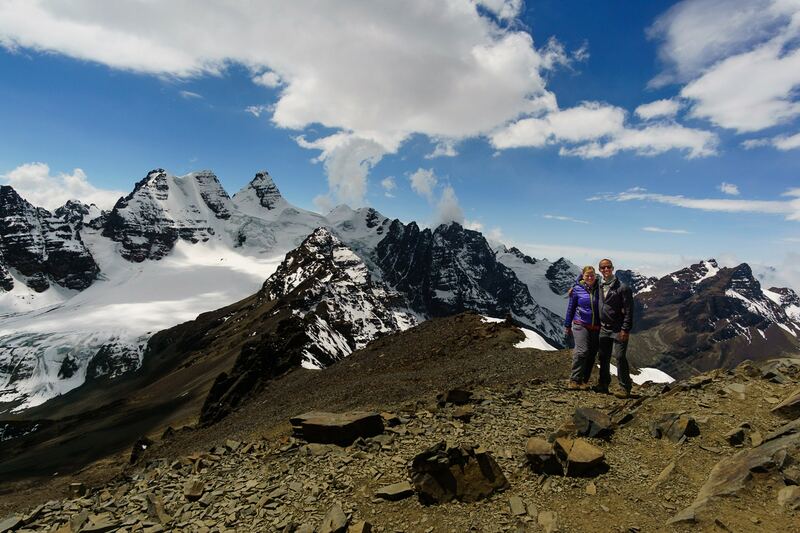 Bolivia’s Royal mountain range, the Cordillera Real is an unrivalled trekking destination. 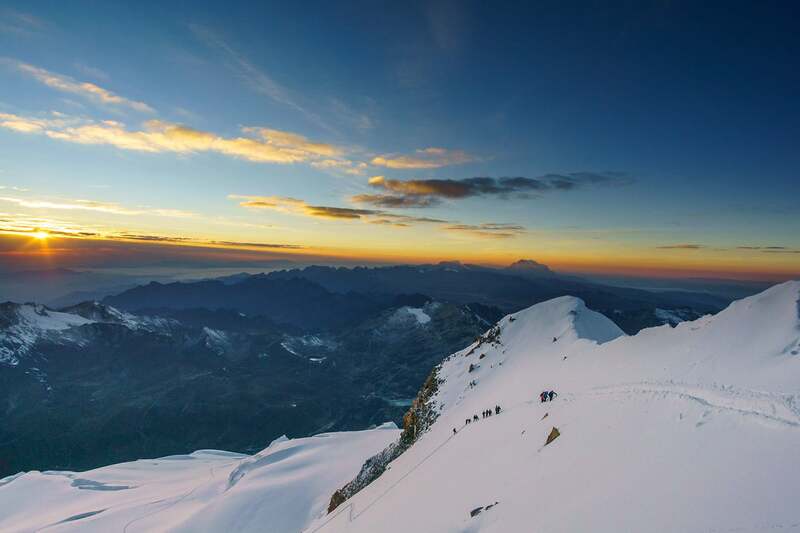 Rising to over 6400m the heavy glaciated chain offers trekking and climbing options for beginners through to experienced thrill-seeking alpinists. 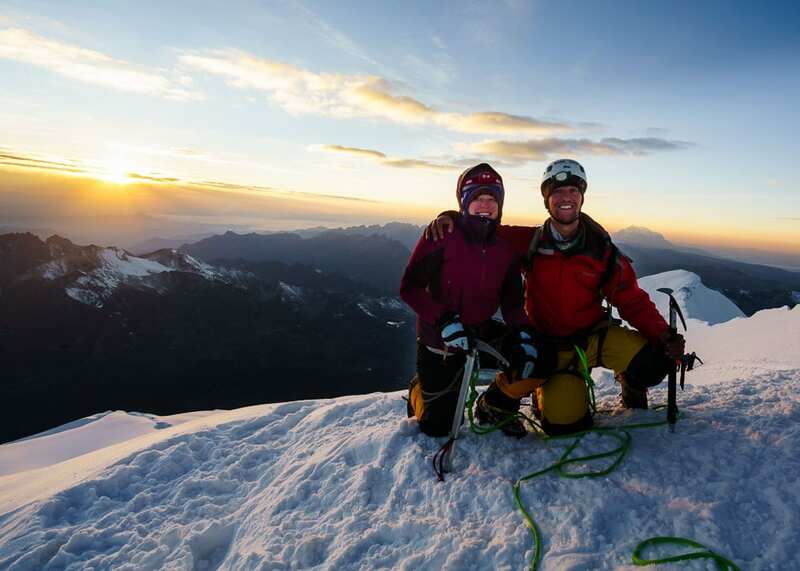 We opted for a blissful 8 day trek where we saw few people on the trail other than the occasional llama farmer and finished our amazing journey with a summit of 6088m Huayna Potosi with the help of our wonderful guide Ronald. As mentioned before, Bolivia gives most tourists a 90 day visa but it’s only valid for 30 days at a time meaning you have to go to an office in a major city and waste a few hours of your life getting your passport stamped again. One way around this is to simply leave the country briefly and then come back to get another 30 days. Seeing as how some Salt Flats tours will start in Uyuni and drop you off in San Pedro de Atacama, Chile, we opted for this. We took a rather uncomfortable overnight bus to Uyuni from La Paz, arriving at 4:30am where we were quickly “guided” to a cafe by a disgruntled teenager. There we waited for the tour shops to open and set up a last minute 4 day Salar de Uyuni tour with a transfer to Chili . This was a jam-packed tour where we toured many sights while crammed into a jeep with 5 other people, which was a bit of a shock to our system after our quiet days in mountains. 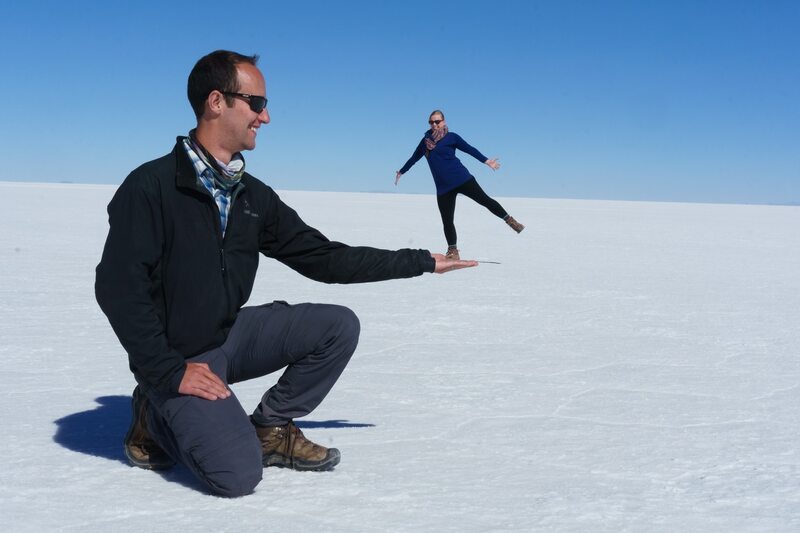 The world’s largest Salt Flats hardly need an introduction and were even more spectacular in person, but the other places you visit on the 4 day tour were pretty incredible as well. 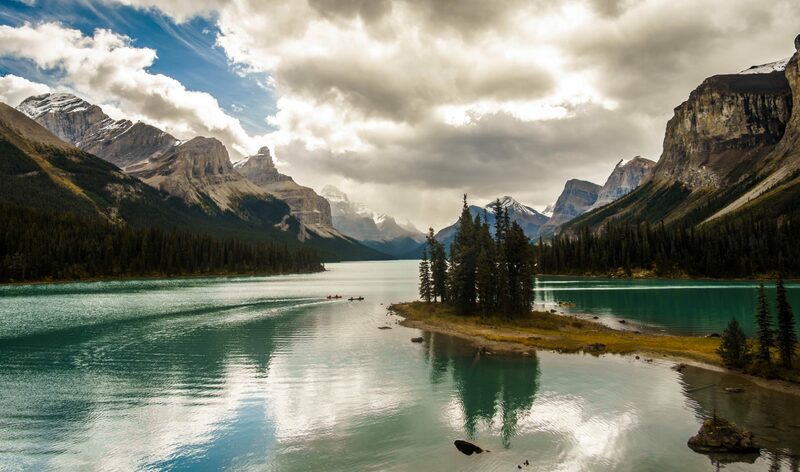 From colourful alpine lakes teeming with flamingos, to volcanic moonscapes and gushing geysers, the landscapes in this part of the world are in a league of their own. 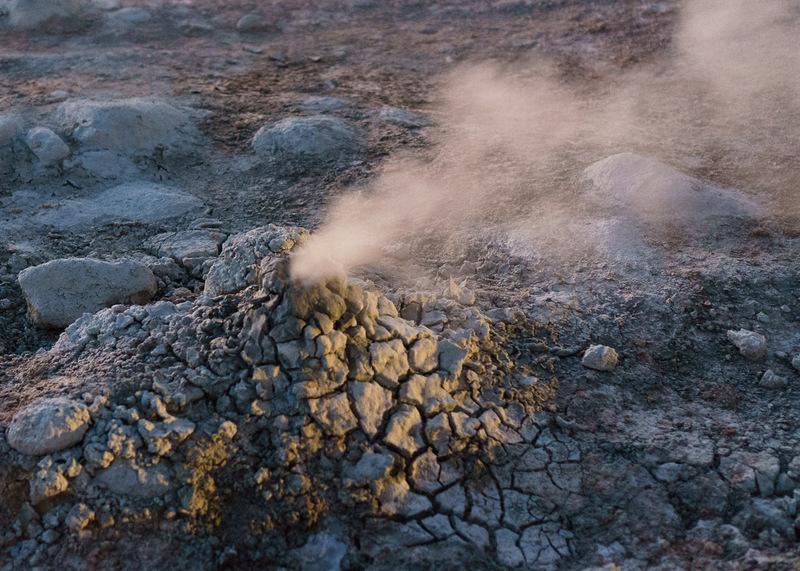 We finished our tour with a sunrise soak in a hotspring before crossing over to San Pedro de Atacama in Chile where we experienced about a 30 degree temperature shift between a frigid morning on the Altiplano to the burning afternoon sun of the Atacama desert. Returning from hot and dry Chili to Bolivia, we headed to hot and humid Parque Machia near Villa Tunari in the rainforest to volunteer with Comunidad Inti Wara Yassi (CIWY). The organization has an almost mythical reputation among backpackers and tends to inspire people to return over and over again. Most people go wanting to work with the monkeys but I went for the birds, so I was delighted when they offered me to chance to work with them. Phil on the other hand, was a bit less thrilled to work with the coatis, although they ended up growing on him. For those who don’t know, coatis are small racoon-like critters that look and behave a lot like a cross between a dog and a racoon, and have the “I’m in charge” personality of a cat. Most of our days were spent feeding the animals, cleaning their cages, and providing multiple forms of enrichment for them. 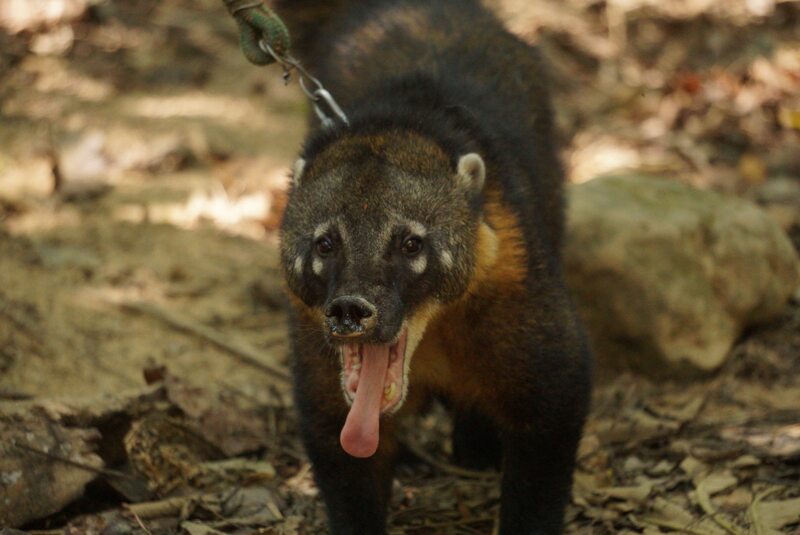 Many of the birds were able to spend some time free roaming in the yard for part of the day but the coatis had to be put on a leash-runner system….a complicated and time consuming process to say the least. Unfortunately, there is a massive wild animal trade not only in Bolivia but throughout South America. 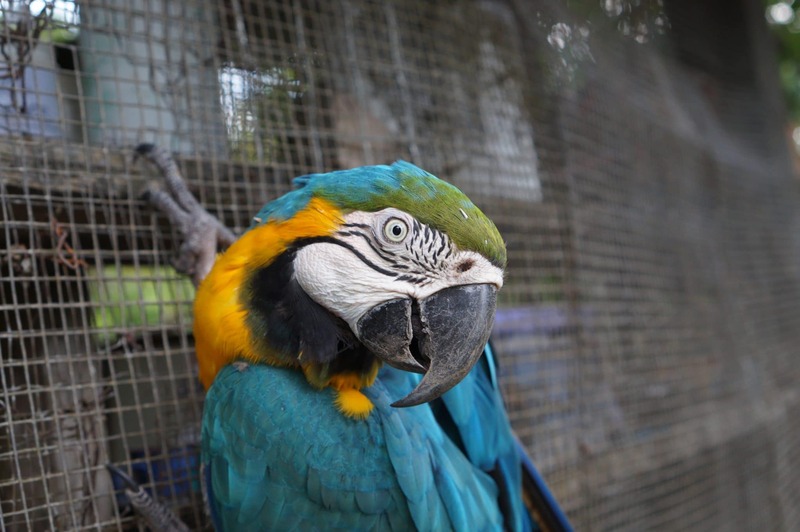 Some of the animals are legally traded but many are trafficked illegally. Unfortunately some studies find that 9 out of 10 animals die before reaching their intended destinations and for those who do they end up being absolutely terrible pets. That is because they are WILD and haven’t undergone a 10,000+ year process of domestication like cats and dogs. 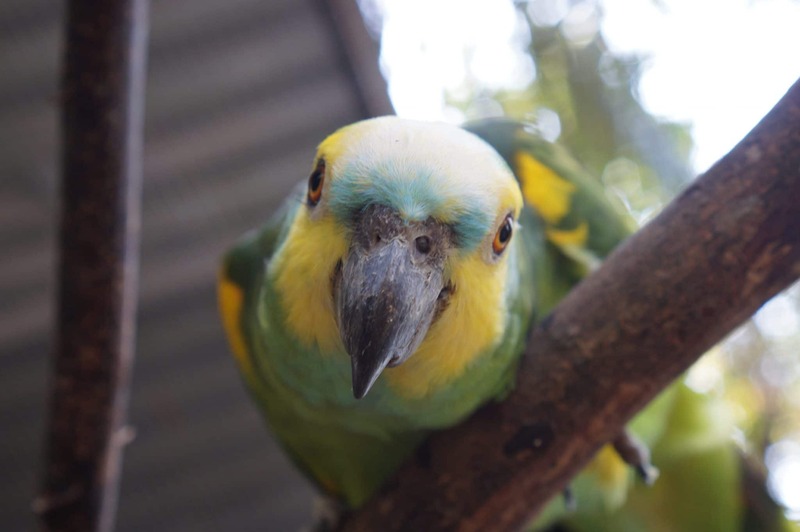 More than half of the 50 birds in CIWY’s care had their wings intentionally broken by human garbage the people who trafficked them or their clueless owners who had no idea how hard it is to look after a macaw that has the human intelligence of a freaking 5 year old. Many other birds had pulled their own feathers out in response to all the newfound stresses they were living with. Because of these injuries, they cannot be released into the wild. CIWY and the volunteers are their only hope of a comfortable 70+ year life. As for the coatis, they have sharp teeth and claws and know how to use them. Most that were intended to be family pets are dumped pretty quickly. But since they were taken when they were babies, they never learned how to fend for themselves and couldn’t be returned to the wild either. Despite their hardships, the animals each had their own little personalities and it was a pleasure to get to know them over a couple weeks. The little turquoise-fronted amazon parrots in particular had me in stitches most days since they are such goofy little guys and it was hard to leave them. Still, we know they are in excellent hands with CIWY and hope to get back to work with them again. Well I want to go back and work with the birds anyway. Turquioise-fronted (aka blue-fronted) amazons are the most trafficked wild birds in Bolivia. 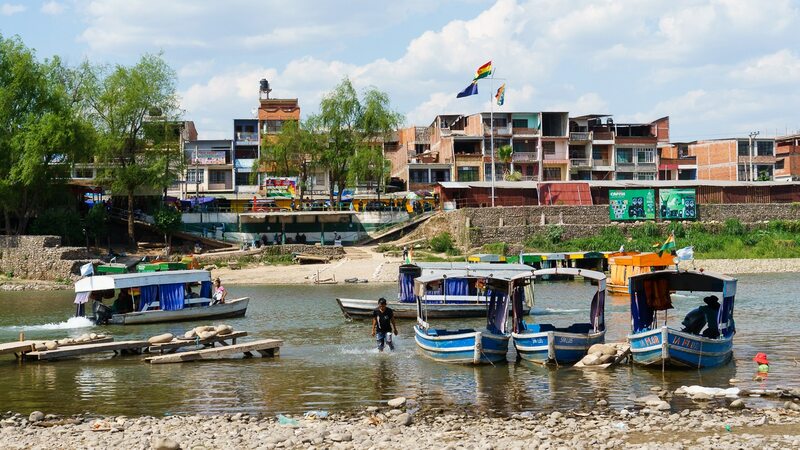 Still sad from leaving the animals, we headed further east to Bolivia’s largest city Santa Cruz de la Sierra, a sort of South American Miami. The city was an expensive bust so we high-tailed it to cute and sunny Samaipata, a town on the edge of the Amboro National Park. There we enjoyed some strolls in the rolling hills and sampled some of the local wine. Funnily enough, we met a Canadian woman from Calgary who sold her house and moved there to work at a wicked good restaurant called La Cocina. We had a nice chat reminiscing about all the things we love, hate, and love to hate about Calgary. during this ill-fated adventure which is a setback we only recently were able to (not entirely satisfactorily) resolve. Amboro National Park, Bolivia, home over over 800 bird species and a metric f*cktonne of ticks. 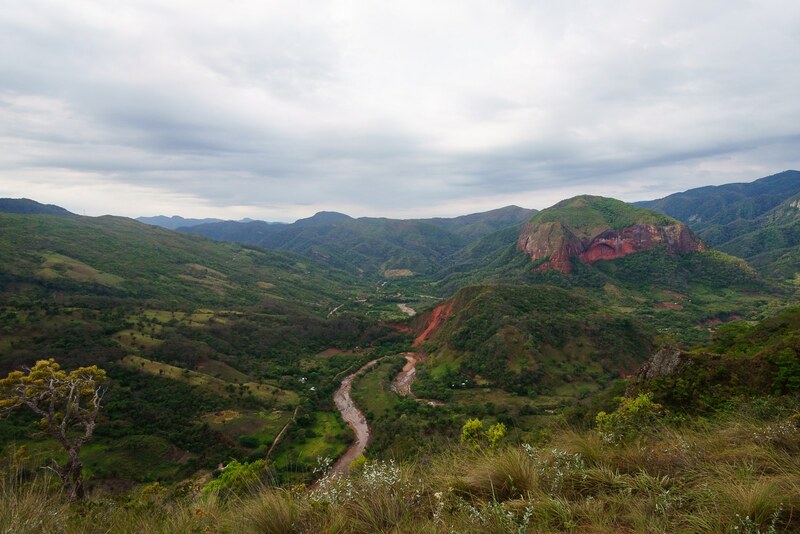 From Samaipata we decided to make our crossing into Northern Argentina from Tarija, which is Bolivia’s wine region. Most people aren’t aware that Bolivia even produces wine, but indeed it does and some of them are pretty good. Yes really. So many snooty Europeans people dismissed Bolivian wine without so much as giving it a try. At about $4.50CAD a bottle, you can afford to give at least give it a try. In particular, we loved the inexpensive Aranjuez Terruño 2017 red that was both easy to find and equally easy to drink. It was even liked by a Spaniard that we met so there you have it. The white of the same variety was passable too. If you don’t like the wines, you could always do as the locals do and mix your white wine with Fanta or your red wine with Coke. We elected not to try this. Since the Terruño was made in Tarija we hoped to visit the winery but that ended up proving challenging. 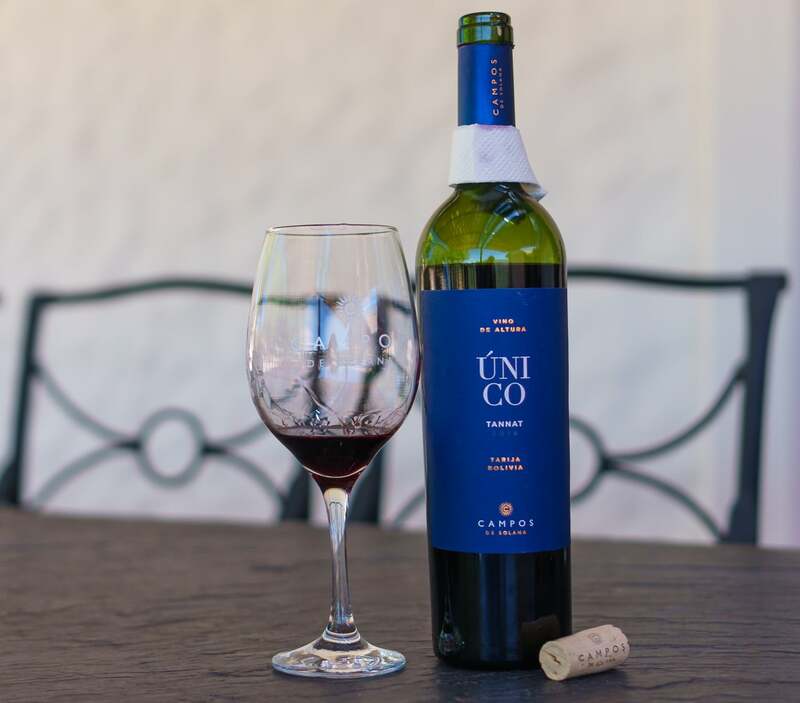 Nevertheless, we had learned that another major wine producer Campos de Solana’s 2015 Unico had won an international award so we figured we would visit there instead. Our research told us that the best way was to get a taxi and go by ourselves which is what we did. Once there, we toured the industrial wine-making facilities and shared a bottle of wine on the beautiful patio. Sadly the 2015 Unico was sold out, but we snagged one of the last bottles of the 2016 one which was delightful. As enjoyable as this was, it didn’t really scratch our itch of doing a winery tour like in the Okanagan Valley in Canada for example, where you’re able to do a couple tastings and learn about small batch winemaking. With this in mind, when we saw an “artisanal wine tour” advertised, we decided to go for it. Now in most places “artisanal” usually means better than industrial. Think small batch craft beer versus Budweiser, but for Bolivia’s wine we learned the hard way that industrial is best. Artisanal wines in Bolivia have 3 flavour profiles which are “sweet, semi-sweet, and dry” and most taste like grape juice with a heavy dose of sediment at the bottom. 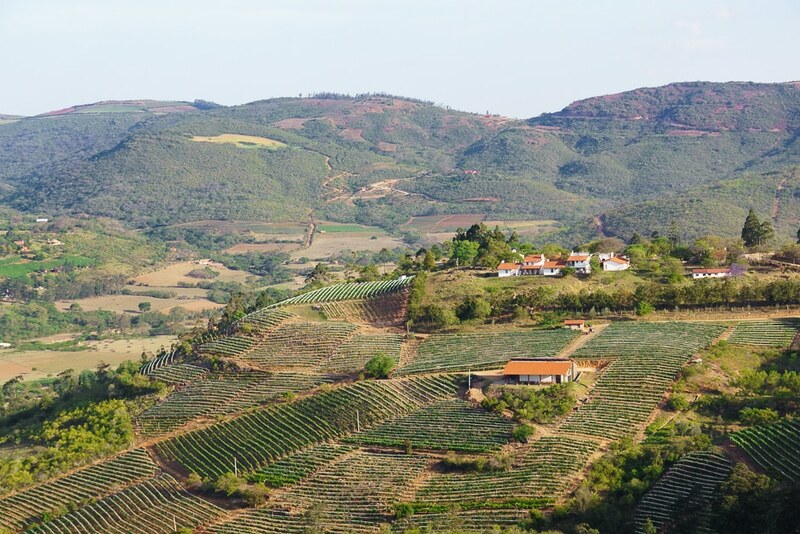 The wineries are in a beautiful setting and the owners do make an effort to provide a good tasting, but the wines will not be like the wines you’re used to in most other parts of the world. They have a distinct taste that may not be to your liking. 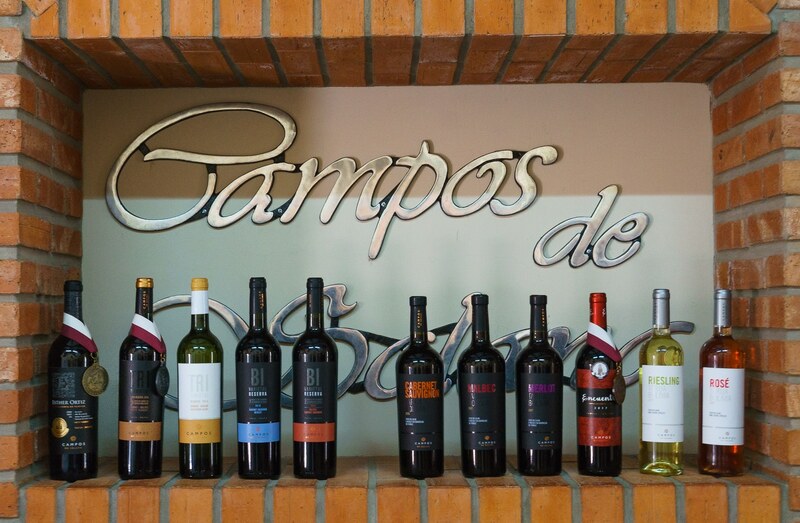 So verdict on Bolivian wines, try some Aranjuez and Campos de Solana’s wines and maybe skip the artisanal ones unless you like spritzers (these would be great for that) or something that tastes closer to a cooler than wine. Whining about wine aside, we had a beautiful Canadian Thanksgiving barbecue with Pablo from La Cupula Hostel and Camping which made for a memorable holiday on the road. We paired it with the 2016 Unico from Campos de Solana! From Tarija, we headed to the border with Argentina at Bermejo. The journey there was relatively straightforward but when we reached the “border”, we were unceremoniously dumped on a sidewalk by a market. “Is this the border?” I asked the driver in my crap Spanish. “Yes, go down there” he replied pointing a river. Yes a river. As far as we could tell, there was nowhere to get our exit stamp so we shrugged our shoulders and walked down to the banks. There we paid for a ticket to cross the river to a no-man’s land on the other side. As we crossed in the boat, we noticed people simple rolling up their pants and walking across the river. Once we arrived at the tiny town of Aguas Blancas on the opposite shore, there were no signs or anything saying “Argentinian Border this way” so we followed the hordes of people walking up a path to the left. At the end of the path there we were in Argentina…illegally! Oh no. After walking around looking confused, we talked to an agent who informed us that we needed to walk back along the path we came up from the boat initially and take a difficult to see path to the right of where walked the first time. Now we were at the Argentinian border and could get our appropriate stamps and tourist visa. Phew, close call. We were very lucky they were nice to us and didn’t throw us in prison for 20 years or build a wall to keep us out. From this crappy, small border hamlet, we needed to get to our next destination of Salta. We goofed and hadn’t changed any of our remaining Bolivianos over to Argentian pesos and this wild west of a border crossing didn’t have an ATM. Looking sad and feeling stupid, we convinced a shopowner to change our money over us at a not entirely highway robbery exchange rate. Pesos in hand, more fun was in store for us. We took a car to Oran and then another before finally arriving in Salta to begin the Argentinian leg of our journey. In the end, Bolivia offered us so many memorable experiences that it was been one of our favourite countries we have visited so far. Despite the occasional challenges of getting around, it’s such a unique and beautiful place that we would love to return to one day. But first Patagonia calls and maybe even Antarctica! One of the definite highlights of our time in Bolivia was trekking the Cordillera Real and summiting Huayna Potosi. I took this photo shortly after we reached the summit around 6AM. On our way up the sun was rising and it had this beautiful red hue (probably because of pollution…). There was another group on their way up which I think gives a sense of scale to the route and the expansive glacier we had to cross to get to the peak. Wow! Another amazing post guys, that trek looks incredible! Bolivia is truly a gorgeous landscape! Wow. Did not like the part about the gazzilion ticks.